Join us again this year for a European Mobility Week (from 16th - 22nd September, across Europe)! Nektarina Non Profit participated in the European Mobility Week last year, when the annual theme was: Travel Smarter, Live Better. Take a look at our photo gallery from the 2010 Car Free Day Event in Zagreb . The European Mobility Week is an awareness raising campaign aiming at sensibilising citizens to the use of public transport, cycling, walking and at encouraging European cities to promote these modes of transport and to invest in the new necessary infrastructures. 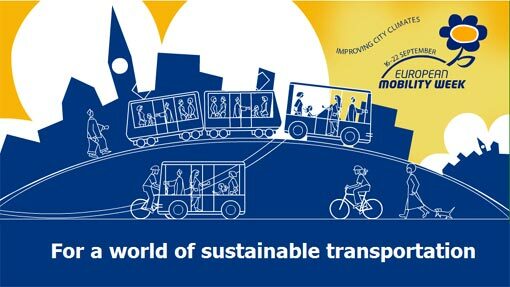 From 16 to 22 September 2011 the Mobility Week is the opportunity for European cities and towns to participate to the most widespread event on sustainable mobility. The overall aim of the European Mobility Week campaign is to encourage public awareness of the need to act against pollution caused by the increase in motorised traffic in the urban environment. In fact, it is not just a question of fighting atmospheric pollution or noise but also of improving the quality of urban life. show the town in another light thanks in particular to reduced motorised traffic within restricted areas. It is an opportunity for all the participating cities and towns to show how much environmental issues concern them. The operation will allow them to express themselves on the matter and at the same time give citizens an opportunity to show their support by their interest and involvement, for measures for a better quality of life in the urban environment. Because to offer everyone an alternative means of getting around, necessarily entails rethinking the apportionment of the highways. Therefore, the European Mobility Week is a unique moment in the year when the elected town councillors can test their transport policies and present them to the citizens. Each European Mobility Week (EMW) focuses on a particular topic relating to sustainable mobility, the so-called focal theme. Local authorities are invited to organise activities for their citizens to raise awareness on the focal theme in particular. Moreover, municipalities were encouraged to launch and promote permanent measures that would support the theme. In order to transform itself into an energy-efficient, low emission economy, the EU adopted a series of ambitious climate and energy targets to be met by 2020. These include a 20% reduction of greenhouse gas emissions, a 20% increase of energy efficiency and a share of 20% renewables in total energy consumption. One of the major challenges in meeting these objectives is the increasing volume of travel by private cars, which rely dominantly on oil-based fuels. By focusing on alternative mobility, the tenth edition of European Mobility Week wants to support the transition towards a resource-efficient transport system by promoting clean, fuel efficient modes and human-powered travel. By avoiding, shifting and improving transport at the local level, European towns and cities can improve the energy balance and environmental performance of the transport system and at the same time make urban life healthier, safer and more enjoyable.